Every year we ask our summer intern to do a survey of cover art elements for the top US fantasy novels published in the previous year. You can find more of our findings on the Chart of Fantasy Art, and the Changing Fashion of Urban Fantasy Heroines. Today: Dragons. Green dragons featured prominently on fantasy covers this year — 35% of the dragons spotted wore dazzling shades of moss and emerald. 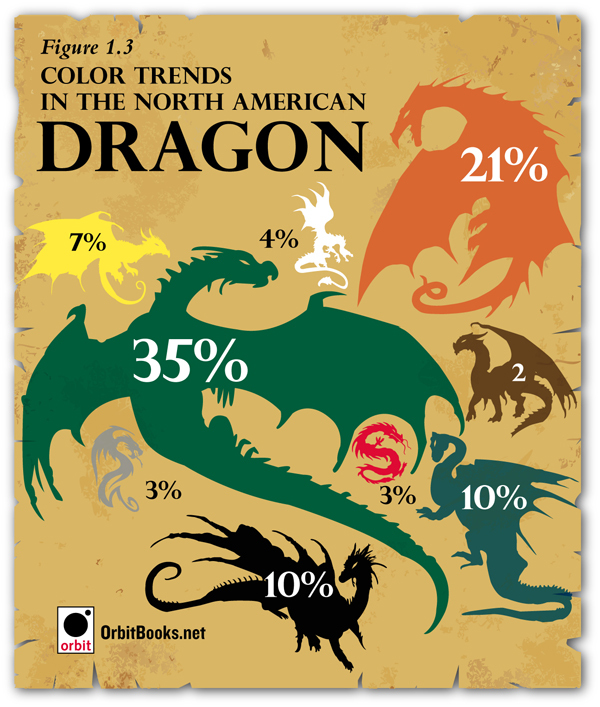 Close behind were orange/rust colored dragons. Although we have no actual proof of this, our best scientific hypothesis is that dragons, being just a fantastical mashup of a lizard and a dinosaur, tend to most frequently follow actual reptilian coloring… BORING. We were happy to see some white, red, and black dragon activity, but one question: Where are all the purple dragons? While the moods of the dragons were difficult to ascertain, we did notice that 15% of dragons were either giving humans a ride to their next exotic locale or associating with them in some other friendly manner. Good news we think. Stay tuned this afternoon for the last chart in our series: Titles!